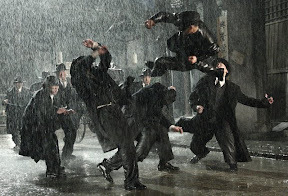 Like the Scarlet Pimpernel inspired Zorro , China’s Kung Fu-tastic mythological legend Chen Zhen may be a Regular Joe (or in this film “Qi”) by day but by night – and quite similar to other likeminded folk hero interpretations of Batman , Robin Hood , Dr. Syn (aka Scarecrow), and Green Hornet sidekick Kato – he’s a justice-seeking masked man out to save his countrymen. And whether they’re based in fact and presented in the format of a biopic or are derived from legends to create a rousing fictionalized account as evidenced in Ip Man and Iron Monkey respectively, Hong Kong superstar Donnie Yen is no stranger to portraying beloved Chinese icons. 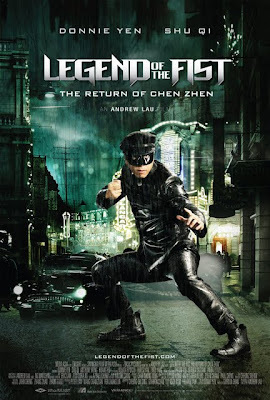 Furthermore, because Yen had already tackled the role of Chen Zhen in the ‘90s TV series Fist of Fury, which in itself was inspired by the Bruce Lee eponymous 1972 martial arts classic and the ’94 Jet Li remake Fist of Legend, it’s only fitting that the title of China’s latest cinematic chronicle of the character subtly celebrates Yen’s “Return” to Zhen as well. Likewise, though the film begins with a mini-Band of Brothers style prologue to reshape and reconfigure this post-WWI interpretation, overall it uses the same basic ingredients of the Zhen storyline involving our hero’s singlehanded resistance to the Japanese invasion of China that culminates in a major showdown at a dojo wherein he takes on every single student, teacher, and opposing pro-Japanese occupation passersby in the frame. 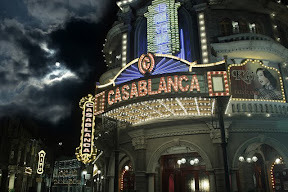 Watering down ‘40s Film Noir with the splashy glamour of MGM musicals in an overt stylistic homage to Casablanca , Legend of the Fist: The Return of Chen Zhen is an artistically ambitious endeavor that immediately reminds you of director Andrew Lau’s impressive background as a cinematographer for Wong Kar-Wai before he helmed the Infernal Affairs trilogy (remade in the U.S. as The Departed ). 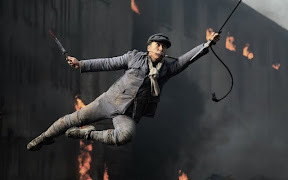 Yet while we’re distracted by beauty from the start whether it’s in the external perfection of Yen’s terrific action choreography to the gorgeous backdrops, it doesn’t take us too long to realize that the filmmakers were emphasizing looks for a reason since ultimately there’s very little left to touch us in the emotionally cold, overly formulaic, passionless production all-around. 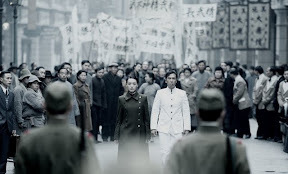 Never quite sure if it wants to be a romance, an action thriller, a flag waving work of patriotic propaganda, a costume drama or a moody espionage Noir, even Yen’s charisma can’t hide the numerous flaws in the poorly structured, overly convoluted script. 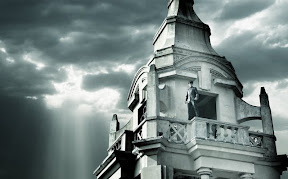 Whether it’s inventing crucial subplots as necessary and inserting them into the film way too late for an unconvincing payoff or revealing the true allegiance of some undercover spies way too early, Legend is further hindered by the one dimensional characters including the unfortunately post-disaster timed stereotypical depictions of “evil” women-beating Japanese invaders and emphatic, all encompassing anti-Japanese sentiment. Obviously out of humanistic sensitivity and for economic reasons, it would’ve been preferable to postpone the release date for a few months. But regardless of how much time goes by, intelligent viewers around the globe are sure to see through the overly silly depiction of foreigners, which detracts rather than enhances Lau’s Legend of the Fist . 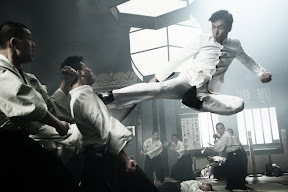 Although I can’t speak for Yen’s TV series, from a cinematic standpoint, the brilliant Jet Li ’94 vehicle Fist of Legend directed by filmmaker Gordon Chan (who also produced this Legend of the Fist ) and choreographed by action-packed fight scene virtuoso Yen Woo-ping (who incidentally directed Yen in Iron Monkey), still continues to tower over all other big screen adventures of Chen Zhen.